The ‘Sandhurst treaty’ – false hope? Has the new agreement between Macron and May created false hope at the Calais border? The new ‘Sandhurst Treaty’, that comes into effect on 1 February, commits to reduce the time taken to process claims for family reunification from the current six/twelve months to under a month in all cases. If it happens, we can only see this as being a good thing, but no one knows yet how it is going to work. There is also a pledge to transfer an additional 260 children under the Dubs scheme, but with a disappointing cap of 480 children under this scheme in total. However, those currently living in squalid and desolate conditions in France will grab at any chance for hope, no matter how slim or misunderstood. 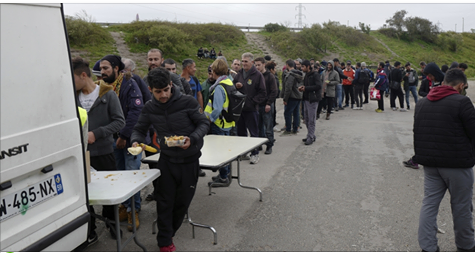 Already around 200 more people have arrived in Calais on the basis of rumors that it may now be somehow easier to get to the UK. Their desperation to believe is heartbreaking to see. The Calais prefecture, presumably in panic at this development, has made a public announcement that no identification of minors eligible for transfer will be done in Calais.